Some 300 protesters marched January 11 outside federal courthouse in Brooklyn, New York, to protest use of federal grand jury against three Puerto Rican independence supporters. BROOKLYN, New York, January 11Today it's me, in the past there were many, and in the future it could be any of you, so I thank all of you for your support," said Tania Frontera. She was addressing 300 people who rallied outside the Brooklyn federal courthouse to protest subpoenas issued to her and two other supporters of Puerto Rican independence to appear before a federal grand jury. The lively crowd, ranging from high school students to long-time Puerto Rican independence fighters, shouted chants such as "Grand jury, FBI, U.S. justice is a lie!" and "FBI and USA out of Puerto Rico!" Similar protests were held in Chicago, Cleveland, Philadelphia, Los Angeles, San Francisco, Orlando, Florida, and San Juan, Puerto Rico. Frontera, a graphic designer, along with social worker Christopher Torres and filmmaker Julio Antonio Pabón, all local residents, were served subpoenas to testify today in front of a federal grand jury. At the rally, organizers reported that the court agreed to the defenses request to postpone the hearing until February 1, allowing more time to challenge the subpoenas. "Because we are here today, the cases have been postponed. Our presence here today will contribute a lot to getting the subpoenas dismissed," event organizer Ana López said at the rally. While refusing to speak about the purpose of the grand jury investigation, FBI officials have made clear that there is an ongoing investigation against the Popular Boricua ArmyMacheteros, reported Jesús Dávila in the December 27 issue of the New York daily El Diario/La Prensa. On Sept. 23, 2005, Filiberto Ojeda Ríos, a long-time independence fighter and leader of the Macheteros group, was fatally shot by FBI agents, an action that sparked widespread public outrage on the island, well beyond people who favor independence. 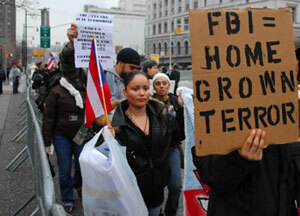 Since Ojeda's death, the FBI has continued its attacks on the independence movement, including heavily armed police raids on the homes of independentistas across the island in February 2006. In practice, federal grand juries have historically been used by the U.S. government to harass and jail independence fighters since the 1930s. They have subpoenaed independentistas to ask them to identify other individuals that might be incriminated. In the 1980s several independentistas were jailed for contempt of court when they refused to testify before grand juries conducting fishing expeditions against the independence movement. Julio Rosado, an independence activist twice jailed by grand juries, told the crowd at the rally, Grand juries continue to be used to repress the struggle for independence and sovereignty. They are nothing more than a witch hunt." Other speakers included city council member Melissa Mark-Viverito, Socialist Workers Party vice-presidential candidate Alyson Kennedy, and Ramón Díaz and Martín González, both members of the Puerto Rico-based pro-independence group La Nueva Escuela (The New School), among many others. "They can say, Come back on February 1, but we'll come back every time and bring more people with us!" said Ben Ramos of the local group ProLibertad, which campaigns for the release of Puerto Rican political prisoners locked up in U.S. prisons. Stop FBI, grand jury harassment!